Austrian poet and writer; born at Chrast, Bohemia, Feb. 3, 1810, died at Vienna March 12, 1894. He received his early education at the Piarists' gymnasium of Prague and at the Piarists' college of Leitomischl, his teacher in Hebrew being Zecharias Frankel. During 1828-37 he studied medicine at Vienna and in Italy, and received the degree of M.D. from the University of Padua. During his stay in Italy he became acquainted with Thorwaldsen, Mezzofanti, Leopardi, Niccolini, and other men of renown. He practised but a short time as physician. In 1838, upon the advice of his friend Josef Wertheimer, he accepted the position of secretary and archivist of the Vienna Jewish congregation. This position he held over forty years. His first poetical production, "Das Habsburglied, Historische Balladen" (Vienna, 1832), gained him an acknowledged position among Viennese writers. These patriotic songs were followed by "Episch-Lyrische Dichtungen" (Vienna, 1834); "Sagen aus dem Morgenlande" (Leipsic, 1834), an imitation of Oriental poetry; and the romantic epos "Christoforo Colombo" (Stuttgart, 1836). He translated Byron's "Parisina" (Leipsic, 1835), and "Paradise and the Peri," part of Thomas Moore's poem "Lalla Rookh" (Vienna, 1835). He was editor of the "Oesterreichisches Morgenblatt" in 1841, and published Josef Emanuel Hilscher's poems after the latter's death. 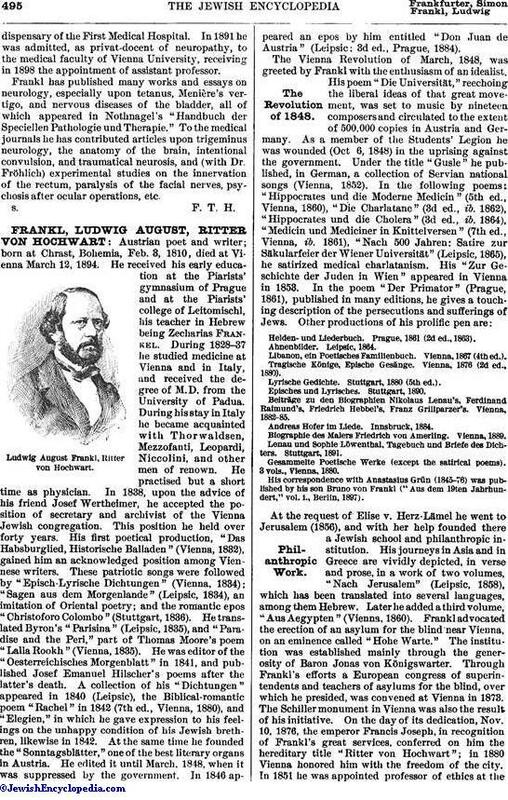 A collection of his "Dichtungen" appeared in 1840 (Leipsic), the Biblical-romantic poem "Rachel" in 1842 (7th ed., Vienna, 1880), and "Elegien," in which he gave expression to his feelings on the unhappy condition of his Jewish brethren, likewise in 1842. At the same time he founded the "Sonntagsblätter," one of the best literary organs in Austria. He edited it until March, 1848, when it was suppressed by the government. In 1846 appeared an epos by him entitled "Don Juan de Austria" (Leipsic; 3d ed., Prague, 1884). Ludwig August Frankl, Ritter von Hochwart. Helden-und Liederbuch. Prague, 1861 (2d ed., 1863). Libanon, ein Poetisches Familienbuch. Vienna, 1867 (4th ed.). Tragische Könige, Epische Gesänge. Vienna, 1876 (2d ed., 1880). Lyrische Gedichte. Stuttgart, 1880 (5th ed.). Episches und Lyrisches. Stuttgart, 1890. Beiträge zu den Biographien Nikolaus Lenau's, Ferdinand Raimund's, Friedrich Hebbel's, Franz Grillparzer's. Vienna, 1882-85. Andreas Hofer im Liede. Innsbruck, 1884. Biographie des Malers Friedrich von Amerling. Vienna, 1889. Lenau und Sophie Löwenthal, Tagebuch und Briefe des Dichters. Stuttgart, 1891. Gesammelte Poetische Werke (except the satirical poems). 3 vols., Vienna, 1880. His correspondence with Anastasius Grün (1845-76) was published by his son Bruno von Frankl ("Aus dem 19ten Jahrhundert," vol. i., Berlin, 1897). At the request of Elise v. Herz-Lämel he went to Jerusalem (1856), and with her help founded there a Jewish school and philanthropic institution. His journeys in Asia and in Greece are vividly depicted, in verse and prose, in a work of two volumes, "Nach Jerusalem" (Leipsic, 1858), which has been translated into several languages, among them Hebrew. Later he added a third volume, "Aus Aegypten" (Vienna, 1860). Frankl advocated the erection of an asylum for the blind near Vienna, on an eminence called "Hohe Warte." The institution was established mainly through the generosity of Baron Jonas von Königswarter. 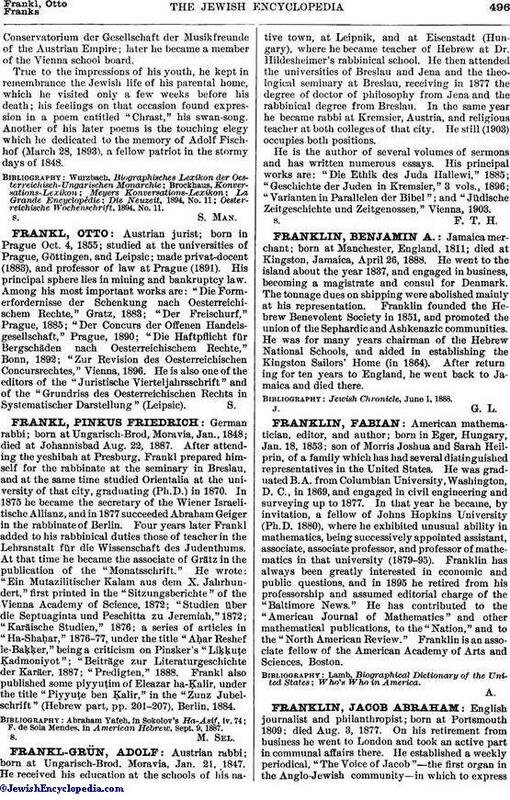 Through Frankl's efforts a European congress of superintendents and teachers of asylums for the blind, over which he presided, was convened at Vienna in 1873. The Schiller monument in Vienna was also the result of his initiative. On the day of its dedication, Nov. 10, 1876, the emperor Francis Joseph, in recognition of Frankl's great services, conferred on him the hereditary title "Ritter von Hochwart"; in 1880 Vienna honored him with the freedom of the city. In 1851 he was appointed professor of ethics at theConservatorium der Gesellschaft der Musikfreunde of the Austrian Empire; later he became a member of the Vienna school board. Oesterreichische Wochenschrift, 1894, No. 11.